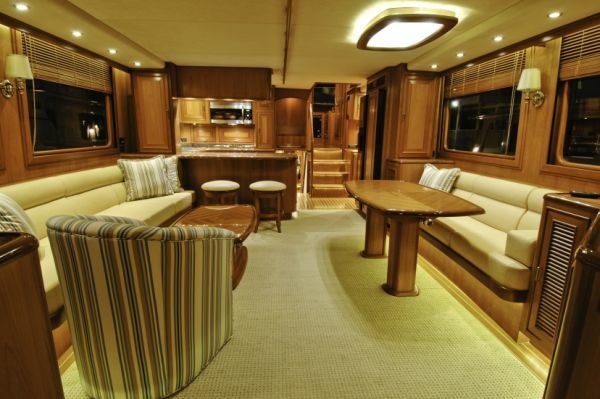 FLEMING 65 - The Serious Cruising Yacht! The Fleming 65 was introduced in mid 2005 in response to a strong demand for an intermediate Fleming between the 55 and the 75. 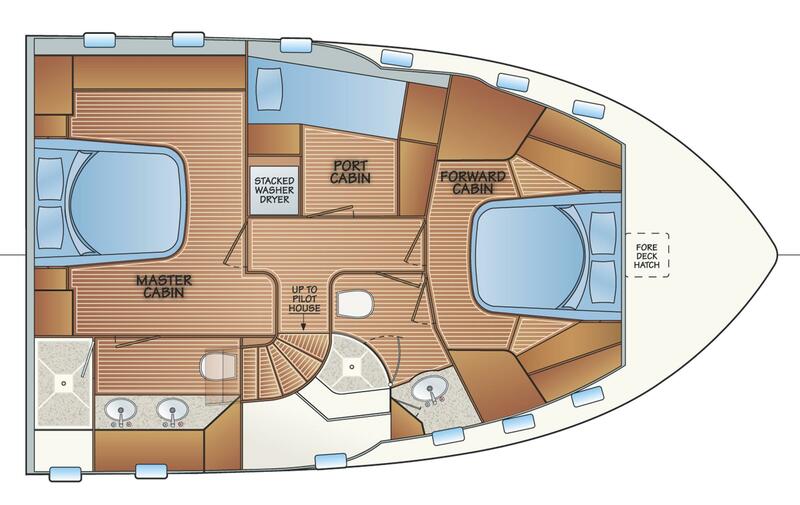 Her layout is very similar in concept to the 55 but the 65, being around 70% larger in displacement, offers much more interior and deck space than her smaller sibling. 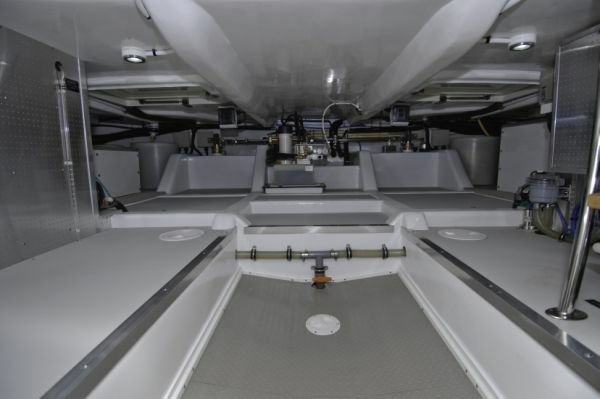 Fleming Yachts decided to retain hull number 1 to evaluate her design performance as a well-found cruising yacht as well as providing a test bed for new equipment. Since commissioning in 2005 Tony Fleming has cruised VENTURE more than 16,000 miles along the West Coast of North America from La Paz, Mexico to Juneau, Alaska, back down the Coast to the Sea of Cortez, to the Galapagos Islands, through the Panama Canal, up the East Coast into the Hudson River, Erie Canal and the St. Lawrence Seaway. Along the way Tony has provided the yard with valuable feedback and suggestions that have been incorporated in the 65 production line. We are very proud that a panel of thirteen judges from the Internationally respected 'Yachts' magazine voted the Fleming 65 best yacht in her class, worldwide, for 2006. Tony Fleming and his daughter Nicky, went to Cannes to receive the trophy. Over 47 Fleming 65's have shipped from the Tung Hwa yard in Taiwan that has built every Fleming yacht since they were introduced in 1985. The yard builds exclusively for Fleming. Available upon request is the Tony Fleming walk through video/DVD. 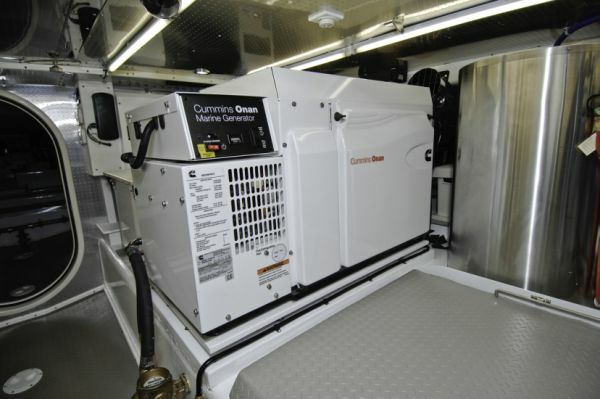 Please contact us for a detailed specification price and equipment list for Fleming 65. Check with us for available delivery date. From the moment you first catch sight of her, it is clear from her elegant lines that the Fleming 65 shares the same pedigree as her sisters. 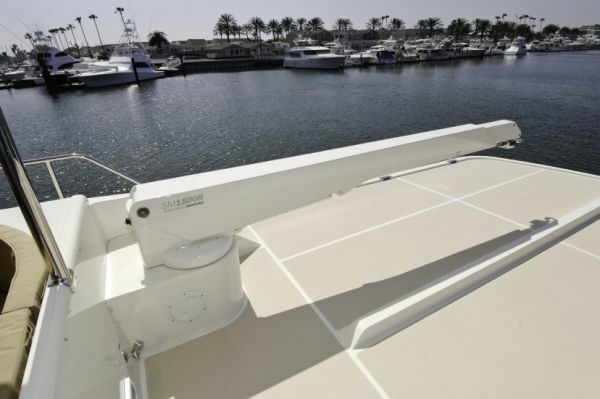 Her low profile contributes to her sleek appearance as well as making it safe and convenient to board her sidedecks without the need for steps. 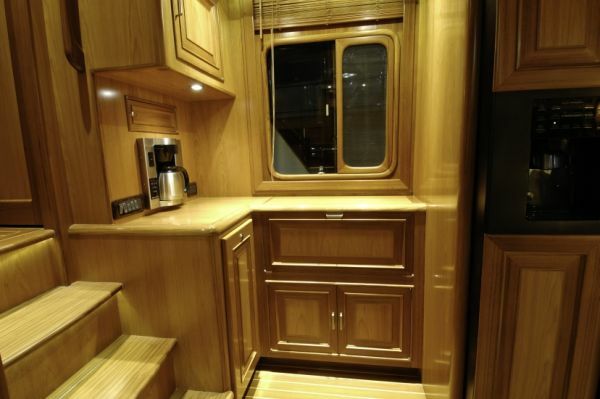 While she retains the basic layout, and many of the features of the 55, her larger size has made it possible to incorporate many ideas from her much larger cousin the Fleming 75 and all the lessons learned during the past twenty years the Fleming marque have been in production have been incorporated into the new design. 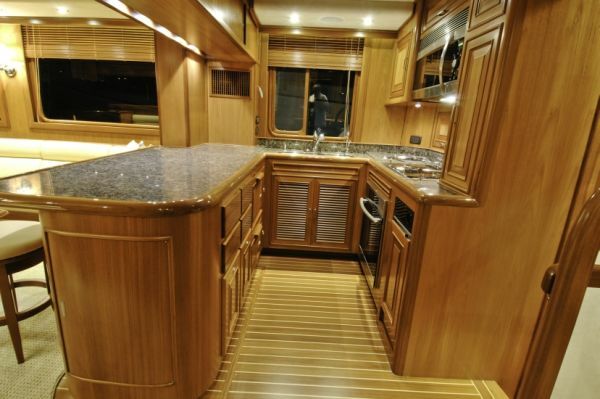 The final result is a boat of exceptional beauty and practicality. 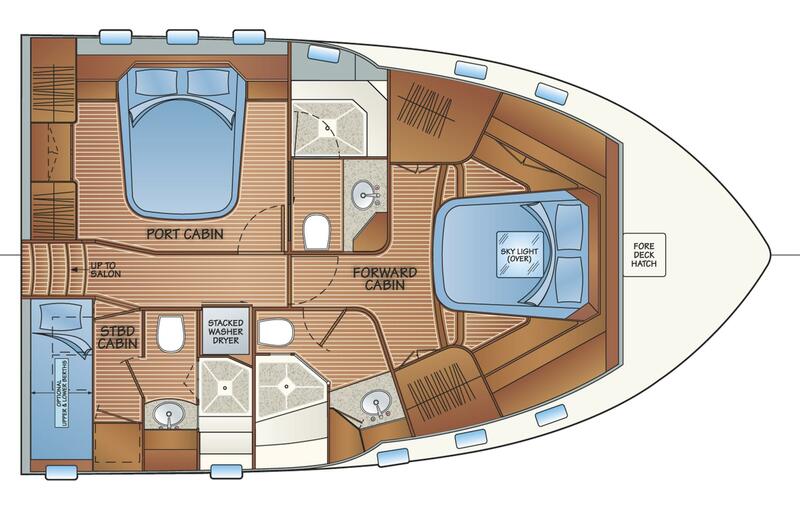 Once again, safety - combined with elegance - has been at the root of all design decisions and the 65 has been built to qualify for European CE Certification for Ocean Class. 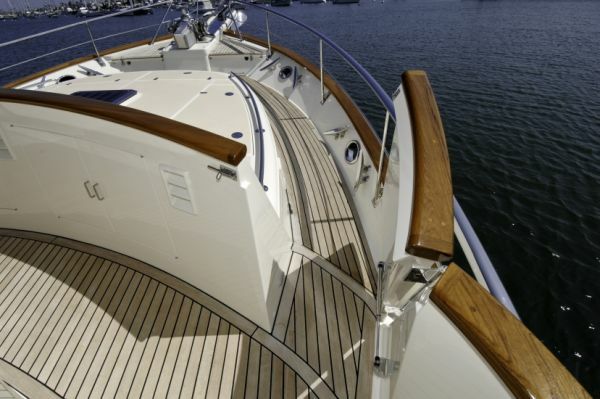 The Portuguese Bridge deck has doors on both sides for access to the foredeck making it convenient to move mooring wands from bow to stern as well as allowing pregnant fishing lines to be moved rapidly along the full length of the boat. 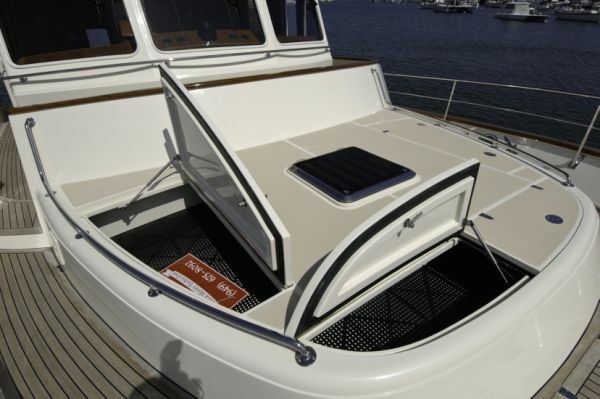 A cabin trunk on the foredeck - whose top is the same area as the entire foredeck on the 55 - provides a great area for sunbathing as well as capacious storage lockers for lines and fenders. 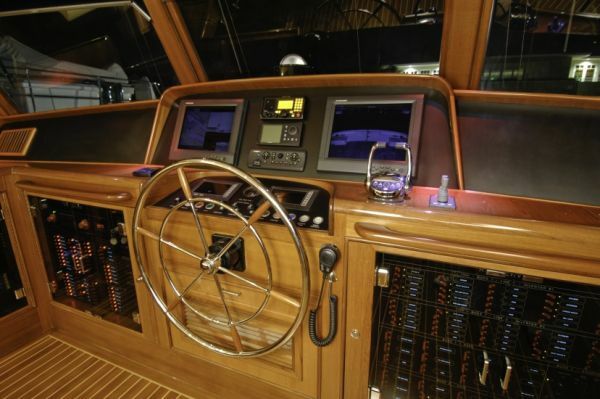 The Flybridge is easily accessed either from the pilothouse or by a ladder from the cockpit. 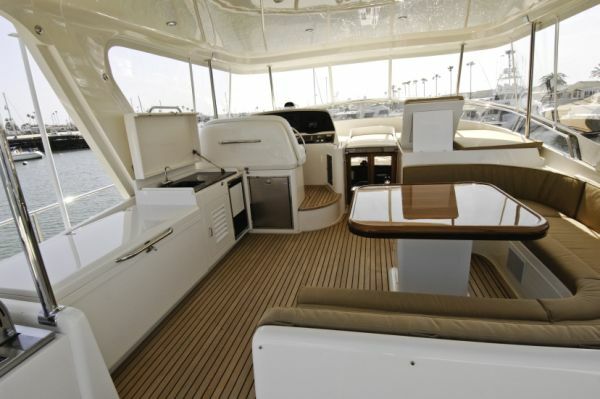 The two-seater upper helm is located to port and is separated from the rest of the flybridge and raised slightly for improved visibility. The electronics console hinges open for easy access to the back of the electronics. 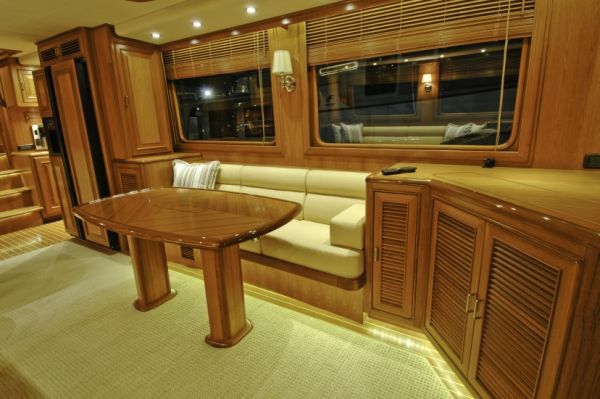 The starboard side of the flybridge features a U-shaped settee with a large fixed table. 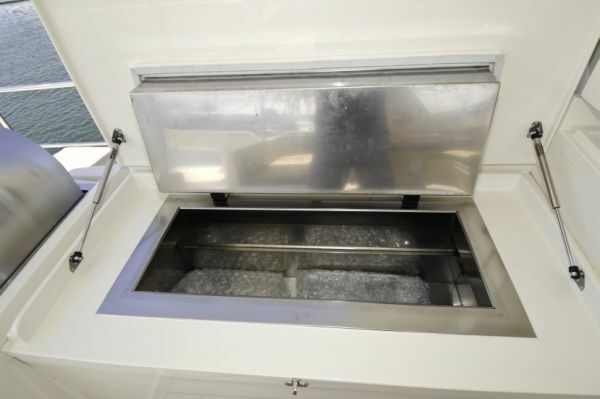 An optional BBQ and/or custom freezer can be substituted for the modular seating on the port side aft of the control station. 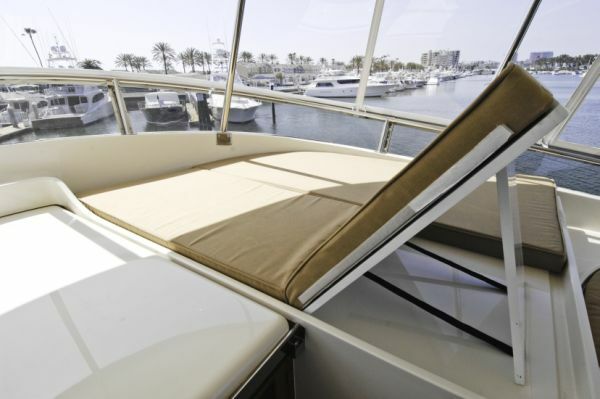 All exterior cushions are made with self-draining foam and Sunbrella covers. An elegant arch provides a sturdy mounting base for radar and the many other antennas essential for today's electronics. 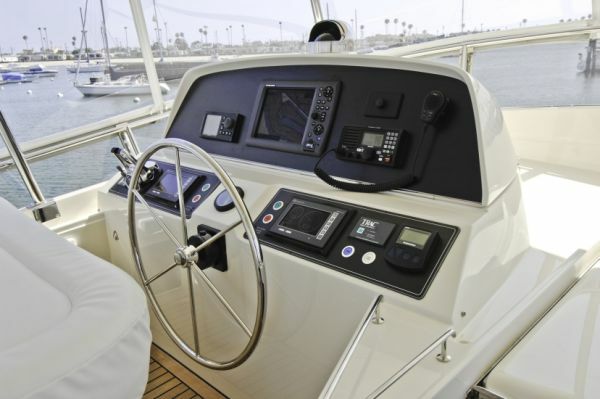 The pilothouse is the nerve center of the vessel. 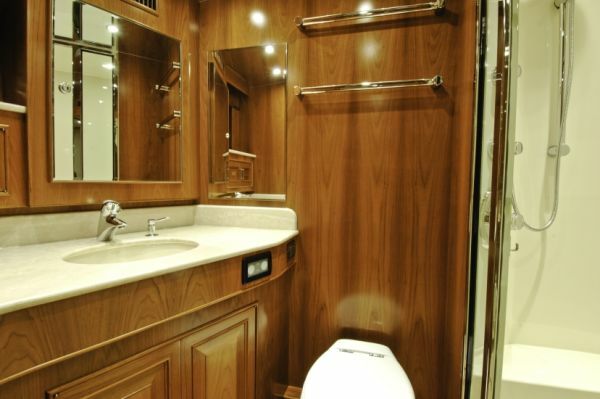 Although similar in style to the 55 it is large enough to accommodate a day head with shower, complete with wash basin set in a granite counter top. 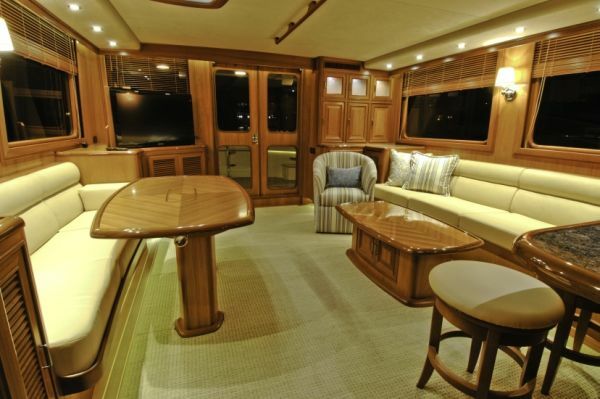 The console area is as large as that in the 75 and provides ample space for a full range of electronics. The switch panels all hinge out for easy access and all labeling is back lit controlled by dimmers. One helmseat is standard but there is space to accommodate a second optional seat. 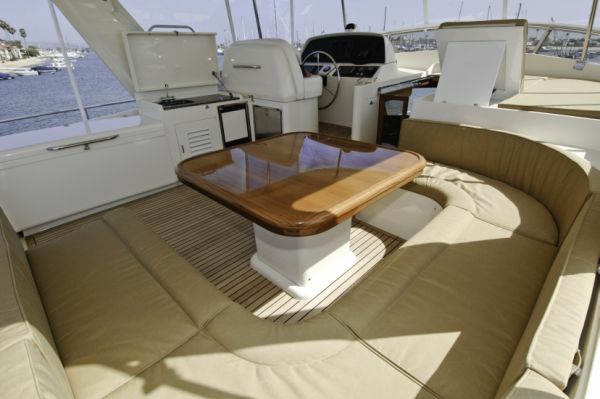 A raised seating area with a table completes the social amenities in this focal point of the boat. 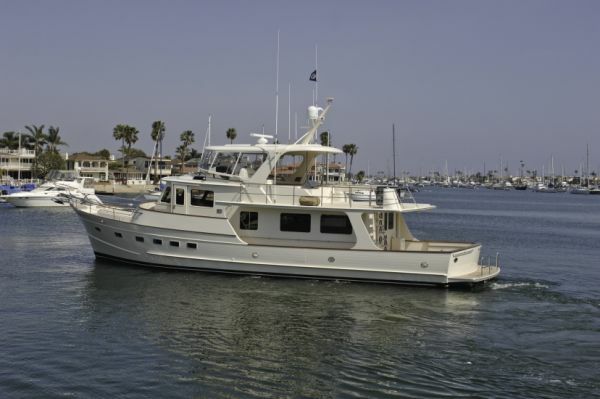 This hull was ordered with the optional pilothouse watch berth filler and pull out canvas berth which accommodates an additional sleeping for two. This is great for crew or unexpected guests. 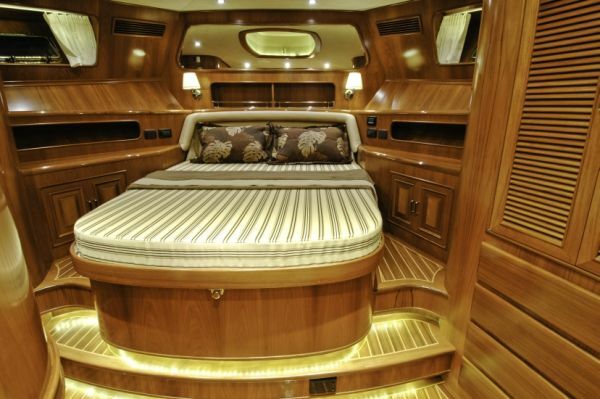 The pilothouse has a privacy door and it's own TV screen for use when doubling as the crew sleeping area. 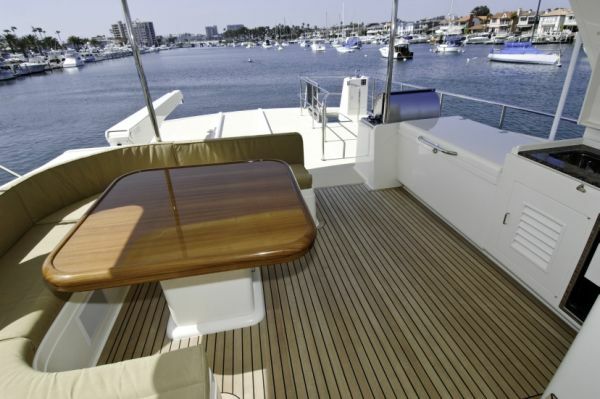 Entering the salon from the aft deck you are immediately impressed by the spaciousness and ambiance. 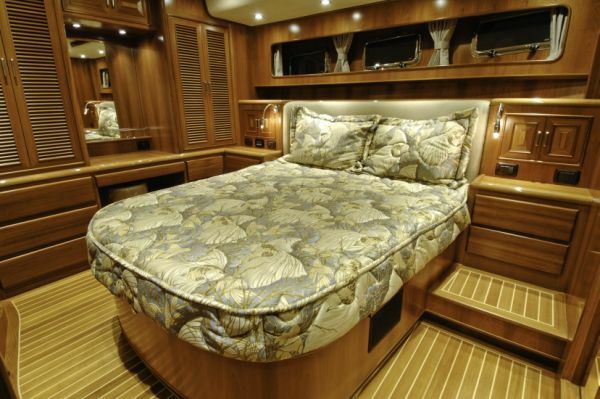 The soft, ultra-suede headliner gives rise to feelings of warmth and relaxation. 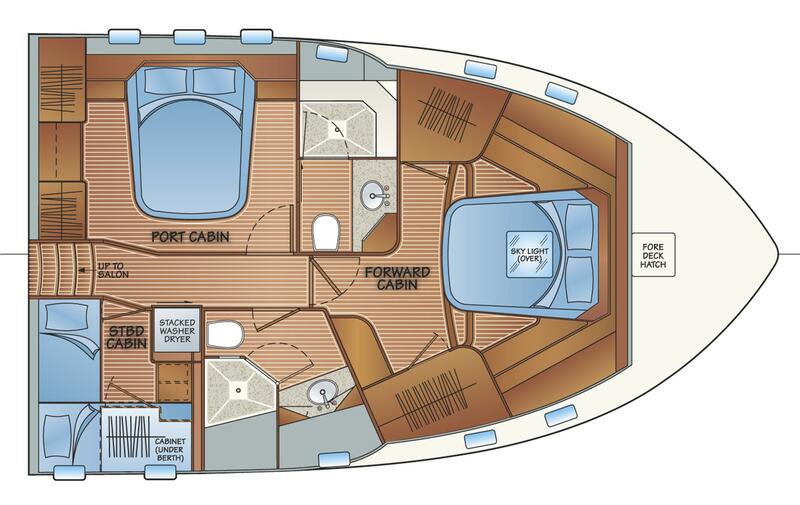 The beam of the 65 provides space enough for separate dining and lounging areas and great care has been taken to balance scale with function. 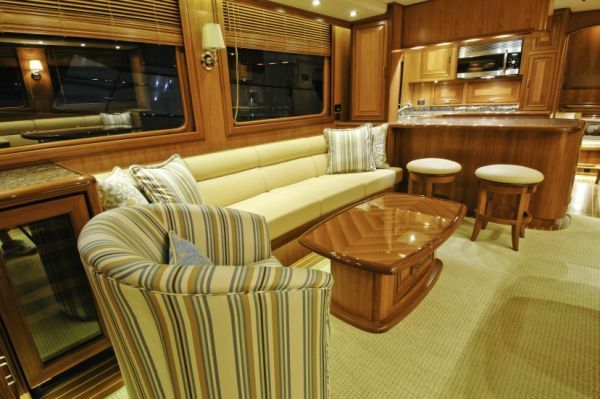 The salon is open plan and encompasses the galley and dining area which can comfortably seat six. 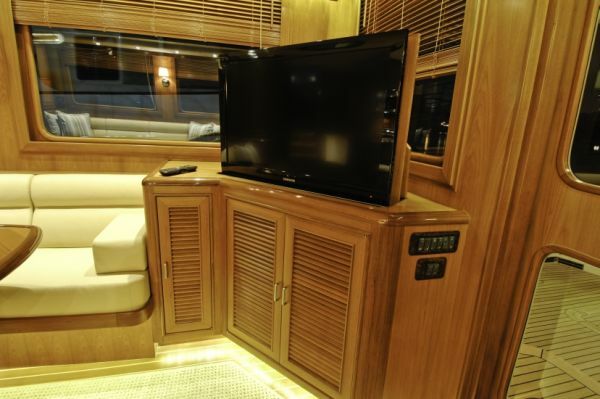 There is space for an optional 37" flat panel TV screen which retracts into a custom cabinet. 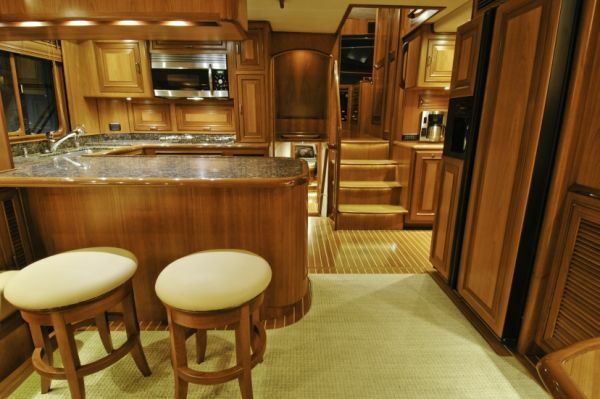 Adjustments can be made to the layout to accommodate individual preferences which can include a wine cooler and a wet bar with its own refrigerator. 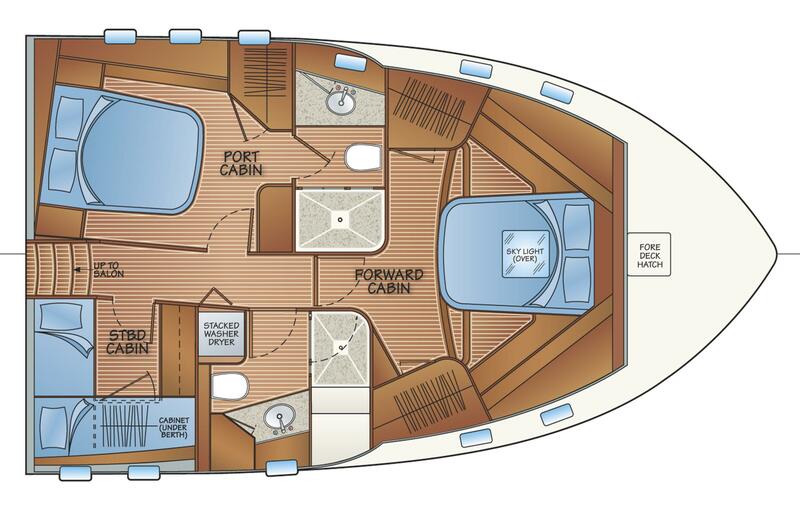 The layout contributes to an easy and convenient flow of traffic through the boat as well as making it possible to appreciate the full length of the boat from forepeak bulkhead to the transom. 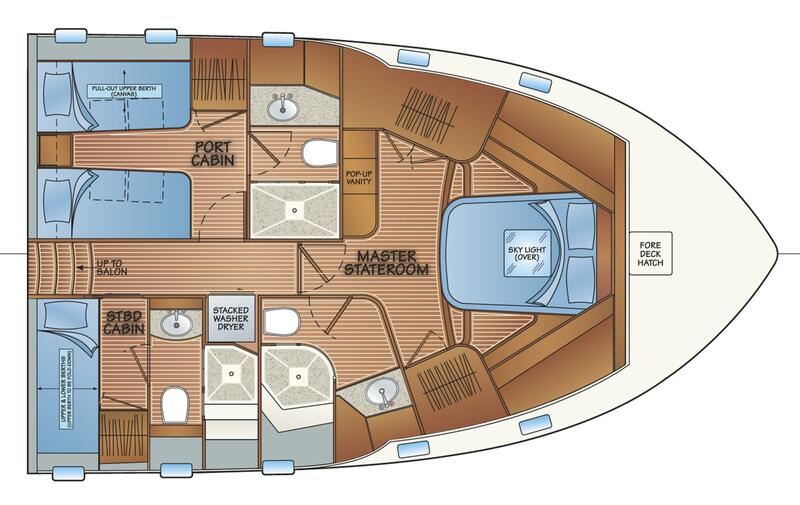 Variations on the layout are offered but the custom ordered layout for this hull features the "Mid Ship's Owner Stateroom" arrangement which features the owner stateroom in the center of the boat with the "VIP Guest" stateroom forward and the 3rd stateroom to starboard. 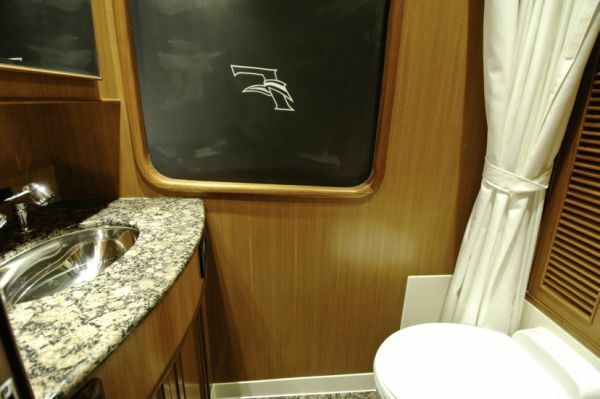 All three staterooms have ensuite heads which are exceptionally spacious with generous glass and stainless steel shower enclosures. 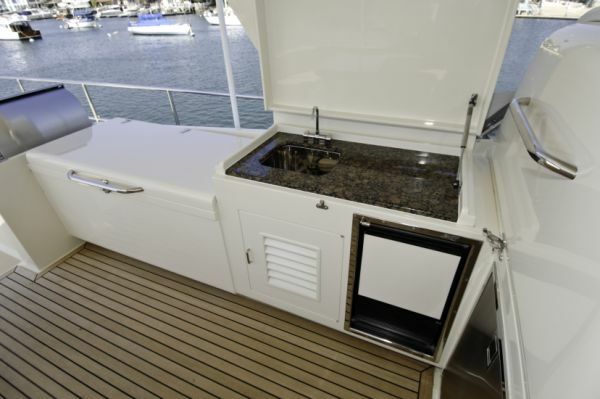 There is also a "Day Head" with shower in the pilothouse. Separate washer and dryer are accessed through a sliding door in the passage. 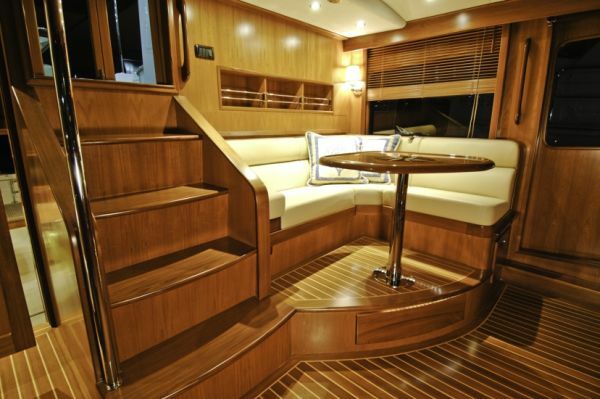 The accommodations are dressed with teak and ultra-suede and offer great comfort and convenience without any steep stairs to negotiate. Medium grey tinted, tempered, glass. Low voltage Xenon overhead lights on dimmers. Headhunter pressure-jet toilet. Bone color. 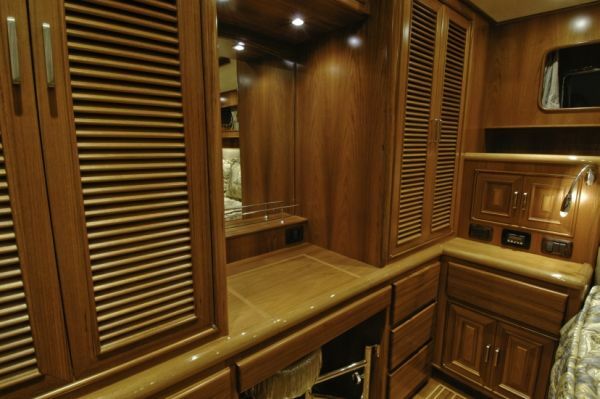 Hanging locker with louvered door & auto-light. Low voltage Xenon overhead lighting. LED Rope lighting and drape tracks at portlight openings. All parts made from molds. Corecell Cored construction with Cook gel coat. S/S trim around roofs, on forward teak cap rail and guard. Italian made exterior locks. 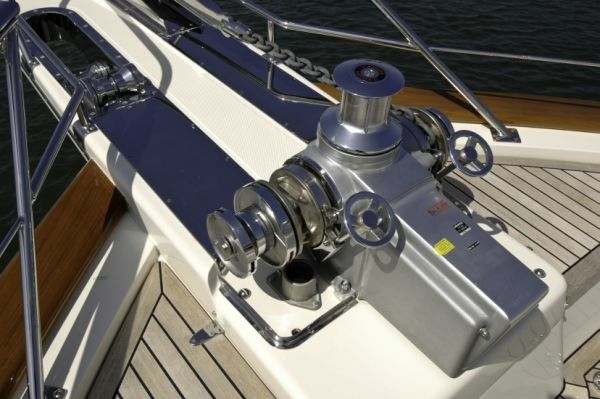 S/S Aquasignal navigation and anchor lights. 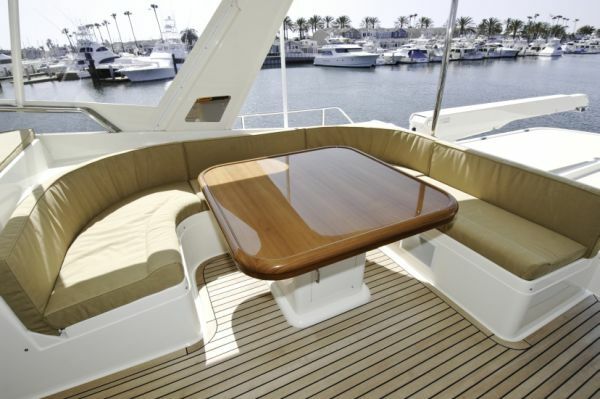 Solid laminate commensurate for hull size, made in female mold. 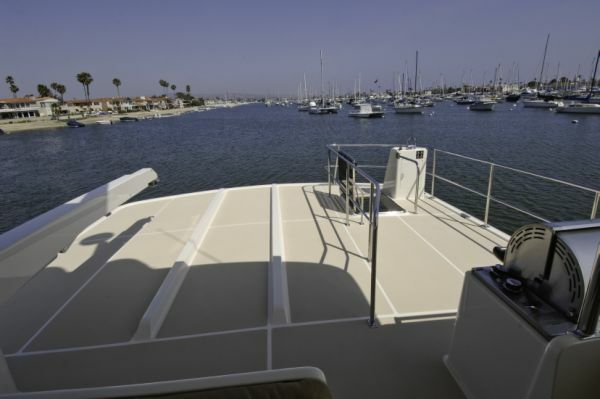 Pettit, or equal, epoxy barrier coat below waterline. 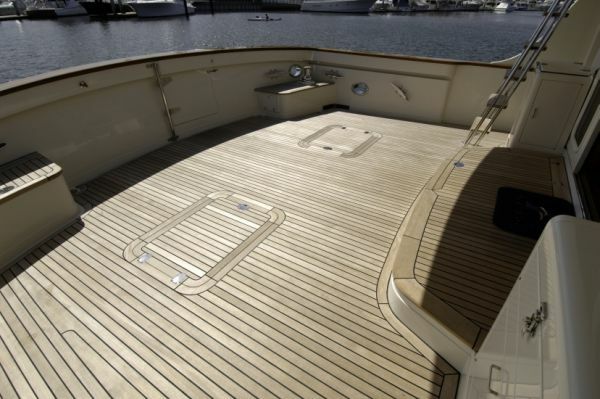 FRP skirt inboard of teak cap. 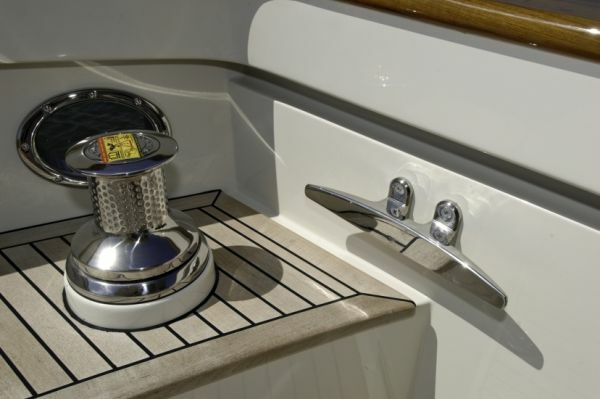 Shore inlets for 220v, 50A AC, Telephone, TV. S/S overhead lights, two per side. 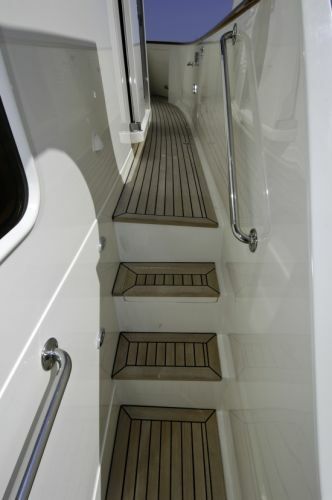 S/S handrails at side deck steps. 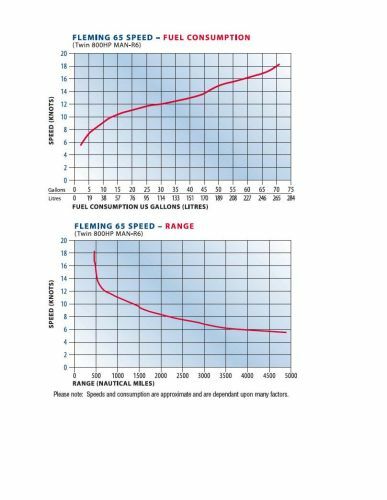 Non-spill fuel fills in steps port and stbd. With custom S/S "F" logo lids.Can fill all tanks from port or stbd. 316 grade S/S 1 1/8" handrail around forward side of pilot house. Deck lockers fwd either side of anchor platform. 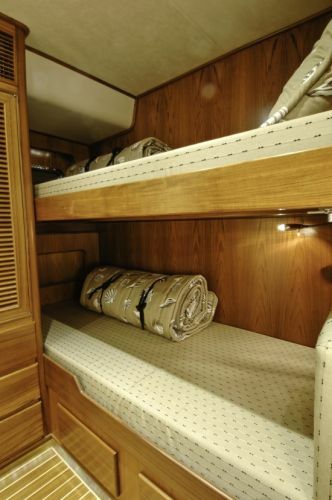 Beige Non-skid on top of cabin trunk. 316 grade S/S pulpit 1 1/4" diameter tube. Welds ground and polished. 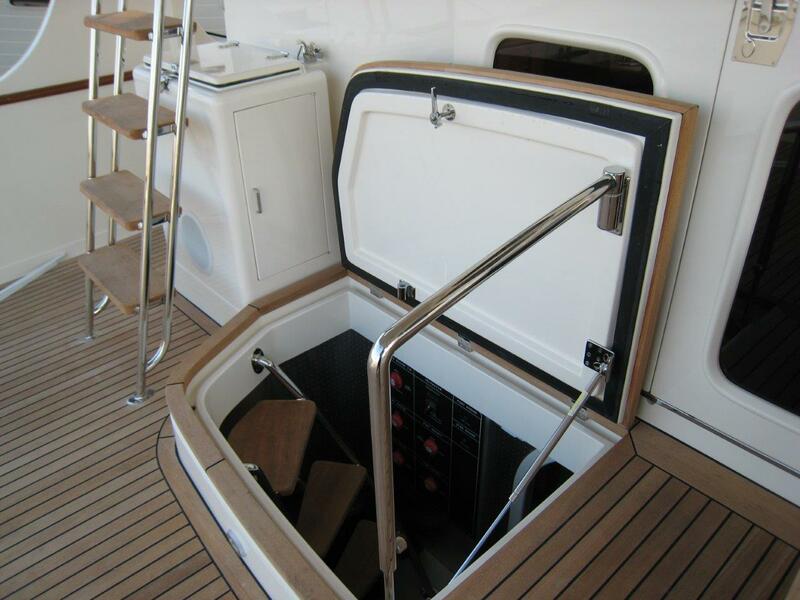 Foredeck LED "F" logo lights at steps through gates thru Portuguese bridge. 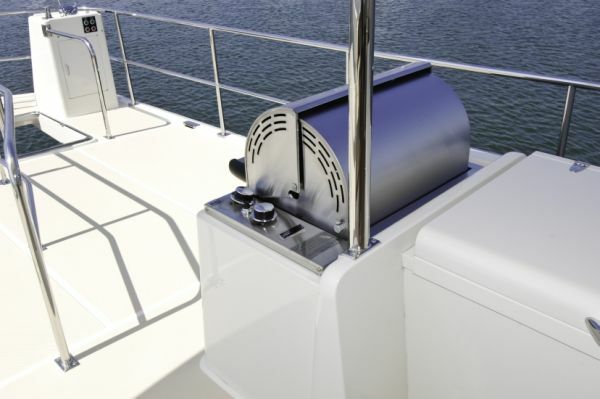 Two shore inlets for 220v AC, 50 amp & TV and phone. Two Mastervolt 24v to 12v DC-DC converters with 12v battery back-up system. 316 grade S/S handrails. 1 1/4" with 3/4" midrail. Shafts Aqualoy 22 Hi-Strength 2 ¾"
Fuel filters. 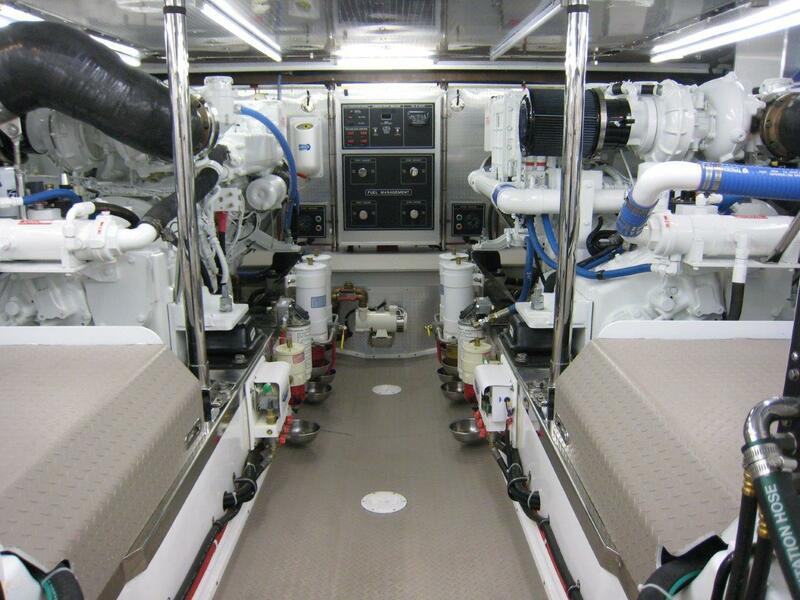 Racor 75/1000MAX Duplex with vacuum gauges for main engines. Imtra light switches and dimmers. 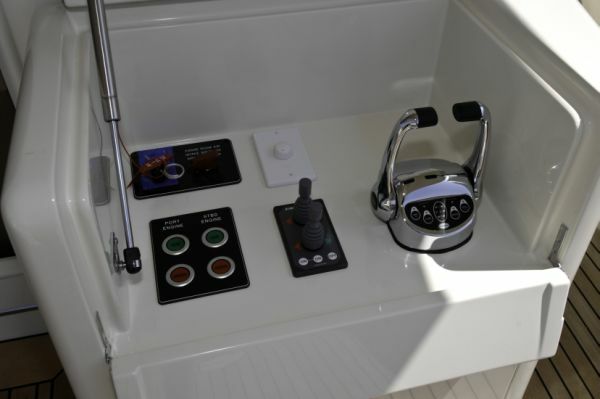 Inverter remote control panel in pilothouse. Main ships system 24v DC. DC load distribution center with breakers. Headhunter Neo-classic at each of 2 heads, Bone color. 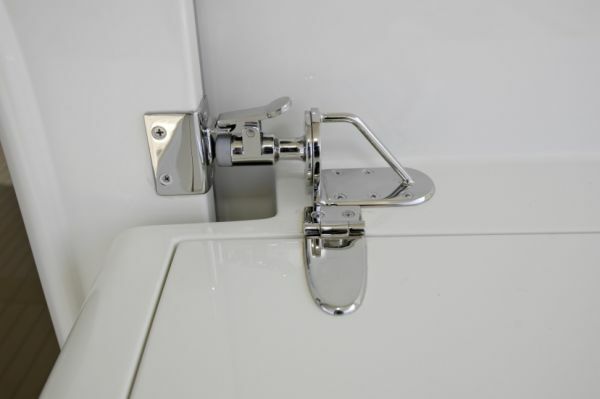 Toilet flushing for both Seawater and Freshwater. 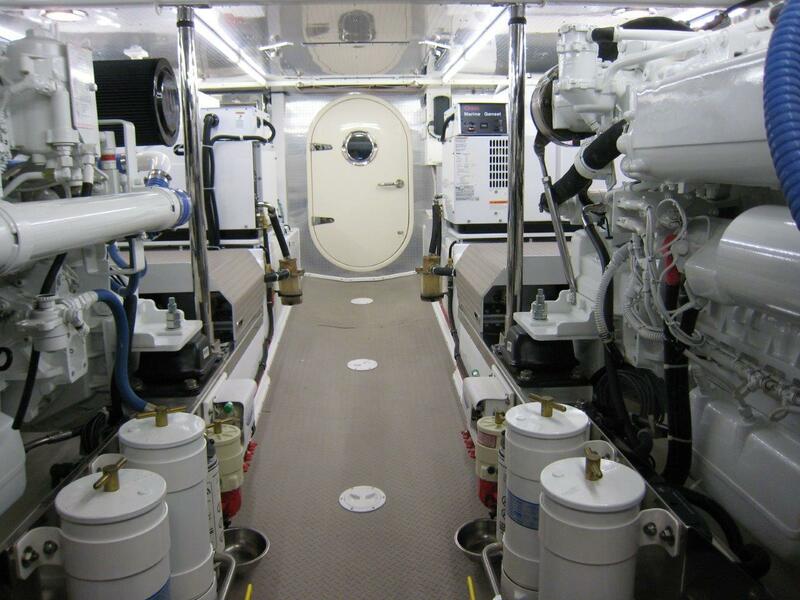 400 USG total in four polyethylene tanks, with drain and isolation valves. 40 USG Torrid water heater with two 220v AC heating elements and two heat exchanger coils, drain & pressure release valves. We are very proud that a panel of thirteen judges from the Internationally respected 'Yachts' magazine voted the Fleming 65 best yacht in her class, worldwide, for 2006. Tony Fleming and his daughter Nicky, went to Cannes to receive the trophy. 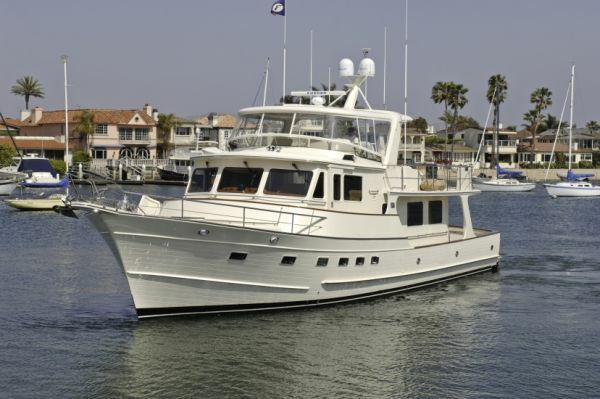 As of October 2008 over 20 Fleming 65's have shipped from the Tung Hwa yard in Taiwan that has built every Fleming yacht since they were introduced in 1985. The yard builds exclusively for Fleming. Available upon request is the Tony Fleming walk through video/DVD. 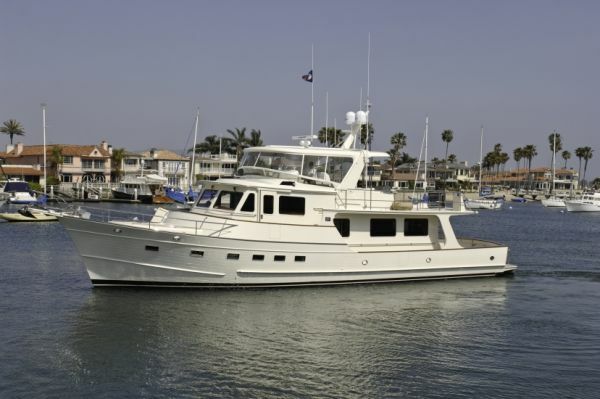 Please contact us for a detailed specification price and equipment list for this Fleming 65 and to schedule your personal inspection of this fine vessel. 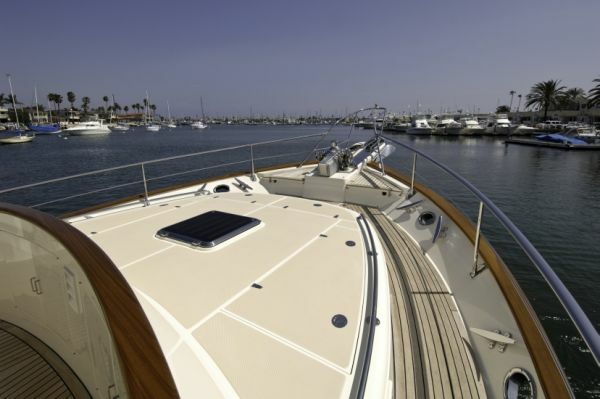 Call for new boat availability. 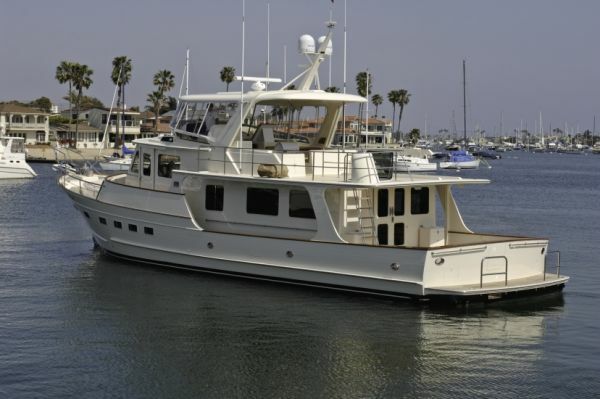 Call Chuck Hovey Yachts for additional information 949-675-8092. *Required. *Required. 6 + 10 = Wrong verification number!